Party discipline has long been too extreme. Another report today. Quite the timing. EXCERPT: Mr. Chong’s bill would restore power to MPs and make them more accountable to their constituents at the same time. In a country known to have the strictest party discipline in the world, the bill would mean that Canadian party leaders would no longer be able to use their MPs as a legislative shield for their own bidding. At the same time, the expectations we hold for our own Members of Parliament – to influence decisions of caucus, and break ranks when their gut tells them to do so – could increase. More from that column relevant to Luff’s situation (below). Column by: Mark Coffin is the President and Founder of the Springtide Collective, a public interest group working to improve the state of democracy in Nova Scotia. He tweets, blogs and speaks on issues related to democratic renewal and citizen engagement. EXCERPT: Before Parliament can become a deliberative space again, party caucuses must be guided by rules that create the conditions under which MPs feel deliberation is possible without demotion, and where leaders have a reason to listen to them. Mr. Chong’s bill would do exactly that. And, since the most basic level of formal engagement with Canadian politics is to elect a Member of Parliament, empowering that member to be more effective is one of the most necessary moves to restore faith in the democratic process and entice citizens to get involved in every level of it. In supporting this bill, Parliament would be opening the door for more meaningful debates on issues that aren’t as black and white as party talking points suggest. It would also make it safe to have more open discussions on fixing parliamentary democracy. This fixes in this bill won’t be the only ones necessary to fix parliament, but it makes sense to put them first. Mark Coffin is the President and Founder of the Springtide Collective, a public interest group working to improve the state of democracy in Nova Scotia. He tweets, blogs and speaks on issues related to democratic renewal and citizen engagement. Party discipline in Canada is much greater than in the UK, but even here, caucus members and backbenchers can fight back against leaders’ offices. It was caucus that got rid of Alison Redford and Patrick Brown, both of whom were elected leader by the party, not the caucus. Both of these were good political moves. But The Westminster model only works best when caucus selects leader. The gradual evolution to having all party members vote on leader appeared more democratic, but has had the opposite effect. Party discipline is necessary to ensure that work gets done, governance happens, and laws get passed. But party disciple without a leader needing to worry about support of caucus leads to the problems Ms. Luff is concerned about. 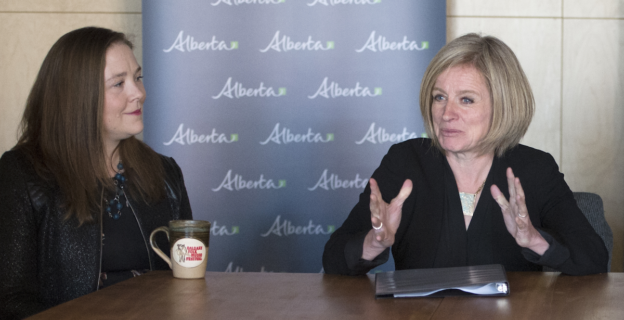 Her concern is not with the NDP, but with the overall state of Canadian political parties. Mr. Chong had the right approach: try to change the system. But to claim that the issue is one party bullying it’s MLAs does not take courage. It takes naivety unbecoming of an elected official. Mr. Harrigan, you will forgive me… but as a feminist, political economist, and a queer trans woman, experience leads me to believe the removal of Ontario PC leader Patrick Brown, in public acquiescence to a highly problematic movement to undermine the presumption of innocence, which is dressing itself up as an advocacy group for ignored survivors, was not a positive event. I don’t think the 4,000 Ontarians who ultimately became less housing-secure as a result would call it a positive event. Why do you? Also it’s worth noting that the Freedom Conservative party is eschewing the position of whip for precisely this reason: The office of Whip has ceased to be an institution primarily concerned with vote-counting and instead has moved onto a rote position of strong-arming. That said, you make a good point about the reduction in responsibility of leadership to caucus… one would think a reduction in responsibilities would lead to a commensurate reduction in rights. I am just a little pawn in the game of life. I have spoken with members of the NDP and have found them to be very interested and moved by my words. 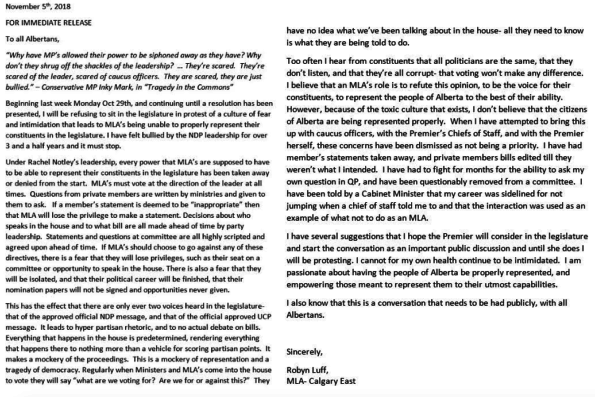 Perhaps the MLA should have considered that the reason she was not being heard, is that she had nothing compelling to say. Moral thinking needs to be tempered with logic. You have to consider the damage your actions may cause to those who are also working to serve the public trust. How can you speak for your constituents in government, when you do not have the fortitude and endurance to even speak for yourself? The existence of the deep six years ago shows that we have a bloated government and are in need of deep cuts to restore our prosperity. We need these deep cuts and we need them now. Bob, what government services that you rely on are you willing to forego to facilitate these cuts? Bob: Cuts are not the answer. Alberta has to play catchup from the cuts that begain with Don Getty and Ralph Klein. They wasted money on the most costliest scandals, got bad oil royalty rates, and Ralph Klein put in a flat tax failure. Hence, the strong cuts. Not good. I suppose Ms. Luff can’t easily compare her party’s discipline and control to other parties. However, perhaps she could have talked to Sandra Jansen about Kenney, the apparently eager disciple of Harper’s total message control strategy. I doubt the grass is greener anywhere else, either for the grassroots or for MLA’s. I am sure the life of a backbencher is not always an easy one, but the nature of politics is parties have to deliver a clear message to voters and not let inexperienced MLA’s go around saying whatever they want. I suppose there is the Freedom Conservative party, which currently lets all their MLA’s say what they want, but of course the leader is the only MLA right now, so I suspect that approach might change somewhat if there were more. Unfortunately for Ms. Luff, outspoken independent MLA’s are also generally ignored by almost everyone too. Why is it that the 19th century was able to accommodate politics that had complex messaging and interplay of several issues across shifting coalitions of elected representatives but in the 21st century you believe it’s a sin to treat the electorate as though they’re smart enough to recognize the presence and value of an intraparty debate? Do you think we have to conduct our politics this way? Its my observation that people want clear, consistent messaging now. Lots of things were different in the 19th century, the pool of voters was smaller, limited to landowning, white men in many cases, debates were on a more personal and local level and when in the media played out over a longer time with more nuance in newspapers. Our current technology and media seems to prefer a quick response and then move on to something else. Whether the change is better or worse, I think how politics is conducted is really a reflection on society and where it is at.